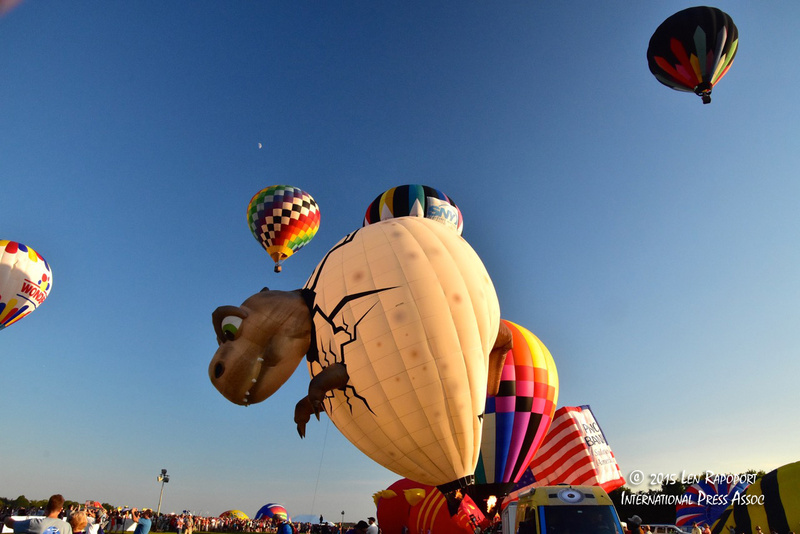 “The QuickChek New Jersey Festival of Ballooning is the largest summertime hot air balloon and music festival in North America and is the premiere family entertainment attraction in New Jersey. It holds the dual distinction of being a recipient of The New Jersey Governor’s Award for Best Special Event, as well as being designated, for the 6th time, as a Top 100 Festival in North America by the American Bus Association. This was our fourth year covering this event and probably the best one so far. We decided to attend on the first day Friday the 24th of July and arrived at the event at 2 PM. On Friday the event starts later in the day at 1 PM and runs until 10 PM after the concert and fireworks display. 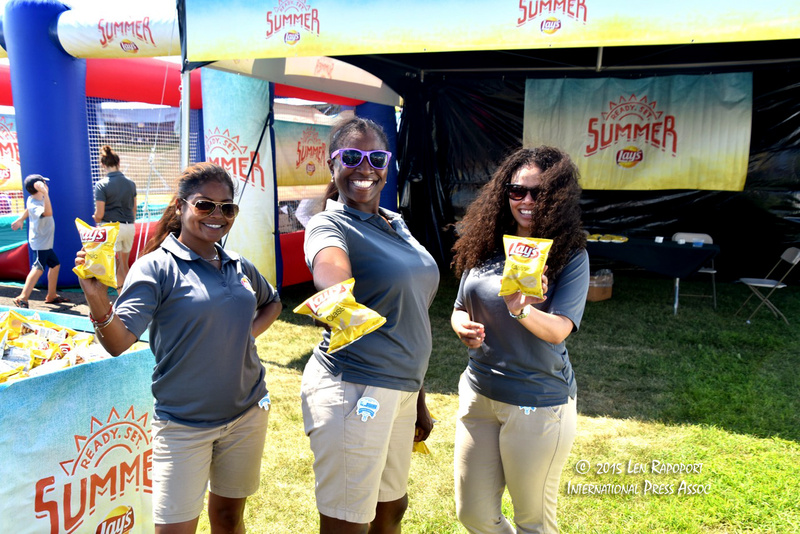 We spent the first few hours visiting all the exhibitors at the festival, many offering samples of their drinks, candy and food. Of course we were also given samples of many other things from Advil to yogurt in a tube and of course tons of little premium items that we were either given or won by spinning a prize wheel. After an hour or so we had to return to our car and unload three large bags full of goodies and begin our tour of the festival one more time. 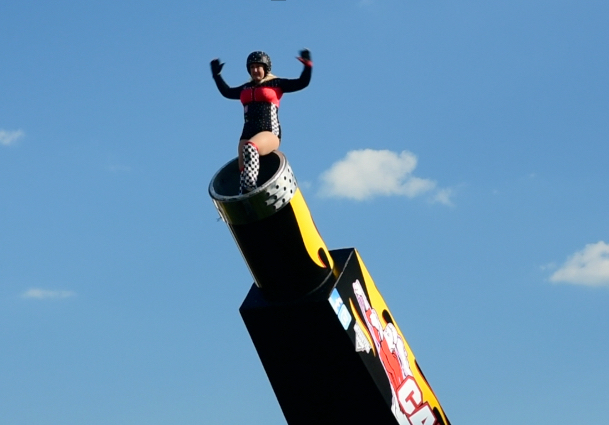 We were pleased to see Jennifer Smith AKA the Cannon Lady again this year. This beautiful woman once again amazed us as she propelled through the air, shot from a huge canon safely into a net. You can see her flight and our complete Day 1 video here. There is a great deal of excitement in ballooning as the thousands that attended watched in amazement as the balloon crews prepared for their launch. Once they unload the balloons from their trailers, they must lay out the envelope (balloon) on the ground, inflate it with cold air using a large fan, then attach the basket and start the propane burners to heat up the inside. As the air inside the balloons heat the balloons begin to rise. During the flight, the captain will continue to start and stop the burners to keep the balloons afloat. Thousands of guests set up their cameras on tripods, blankets on the ground and watched the show as we did. We are fortunate to be on the inside of the fence which made covering this event even better. One of the best events after the Balloon Ascensions of course are the concerts. In the past we attended a Brett Michaels Concert and this night we listened to Don Felder, a former lead guitarist and songwriter for The Eagles, one of the most popular and influential rock groups of all time. This group is a member of the Rock and Roll Hall of Fame, and Don will opened the Festival’s concert series on Friday night. You can see some of the photos I shot at the concert in our gallery. Because of copyright issues we are not able to share the live footage we shot, but in our video you will see him on stage and of course view his photos. 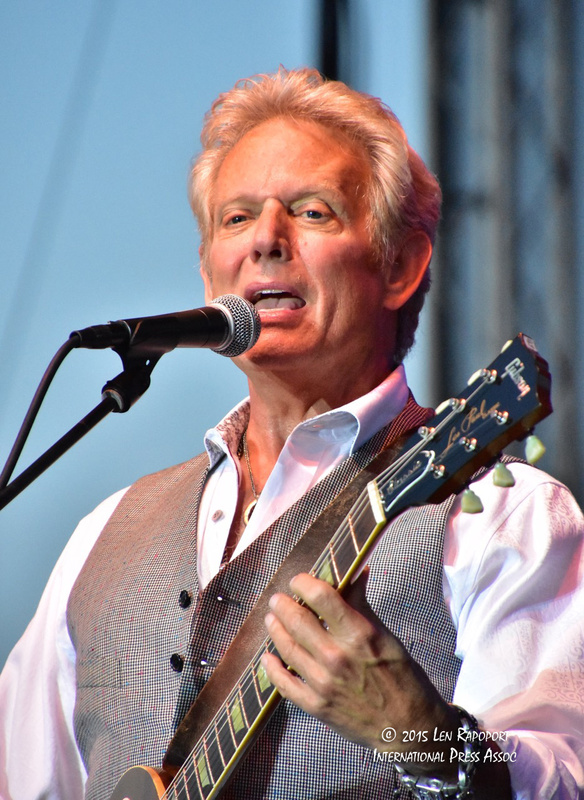 Don Felder, was a former lead guitarist and songwriter for The Eagles, one of the most popular and influential rock groups of all time. As you will hear in our video he is also in the Rock and Roll Hall of Fame and really rocked the crowd. Following the concerts to mark the closing of the days activities is their fireworks display. So if you attend don’t be too concerned about what you will eat during the day, there is so much there including the QuickChek facilities with regular QuickChek prices and tons of vendors as you can see in our photos, plus so much free sampling being done, that you won’t leave the festival hungry. We have included a number of photos in our gallery to give you a better idea of the festival and will upload our video from Saturday that will show you much more. For now, we wanted to publish this article and video from the first day. When you click on an image file it will open in a new window. Close this window by clicking the X in the upper left corner of the page. It will close that image and now reveal our slide show option which also offers a manual way to view each image with left and right arrows on the bottom right of each image file. You can also click an image to advance to the next one too.